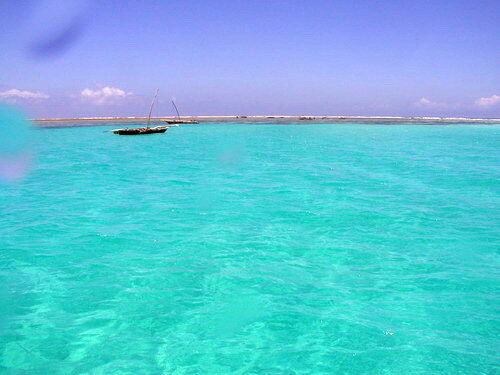 Zanzibar - Our first dive trip in Africa! 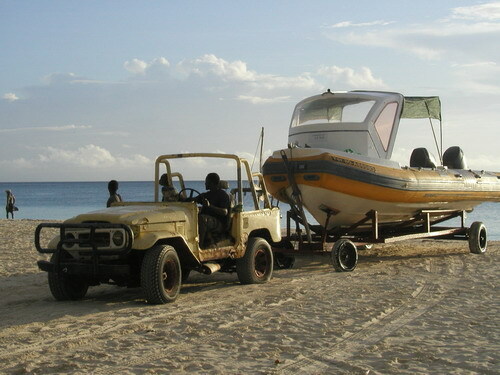 Travelling in Afica was simple and straightforward. We never had any problems. 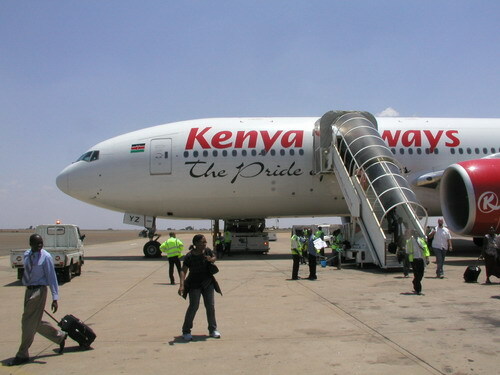 Eithopian Airlines and Kenya Airways were great. 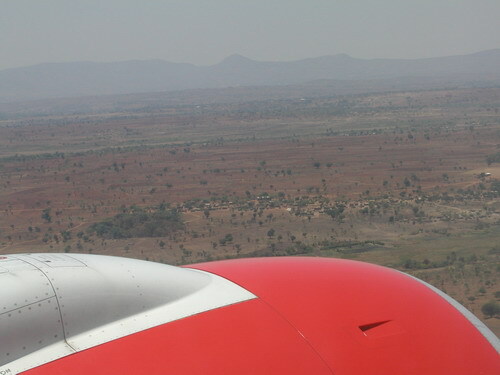 This view shows the predominant terrain in central eastern africa. Flat and dry. Look closely to see a small village of subsistance farmers. Joan and I were in Africa to spend a week doing missions work with Impact Malawi to help little villages just like this one. 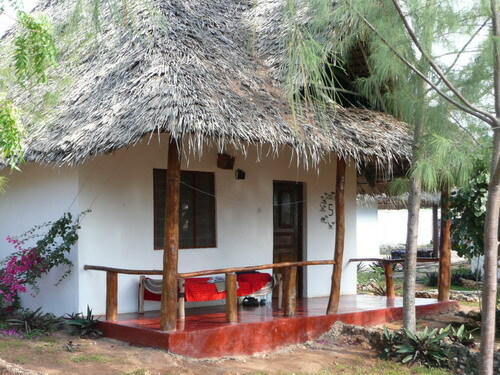 We found a little resort in Zanzibar called Duniani Lodge. They had ten little "huts" like this one. Very modest. 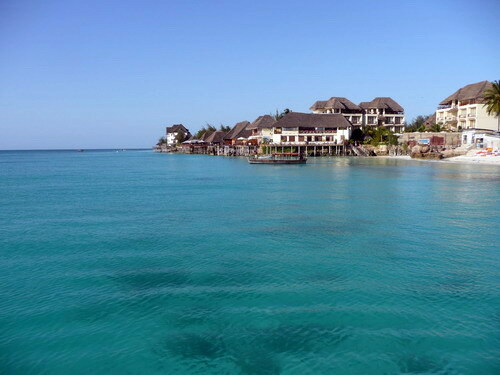 Most resorts in Zanzibar were $100 per person per day, for room only. Duniani was $50 per person per day. 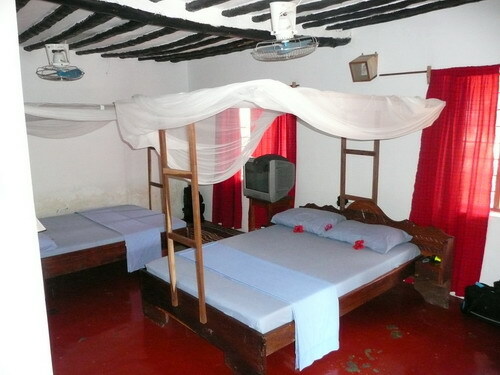 The little rooms were beautiful in their third world simplicity. Mosquito nets are common throughout Africa, as the mosquitoes that transmit malaria only come out at night. A big resturant with thatched roof and open all around held a a dozen tables, a big bar, and a little kitchen in the back. Local Masai natives in traditional dress were always nearby. Some worked as security guards by night, and added "ambiance" by day! 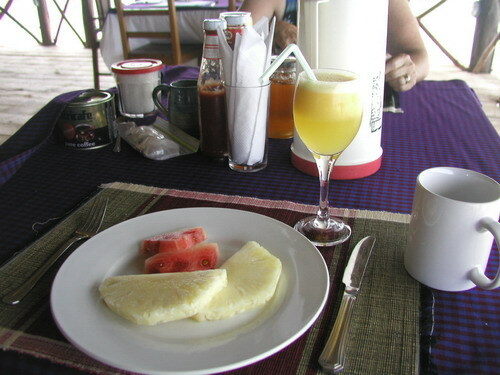 Breakfast always started with fresh fruit. The meals were simple and quite tasty, and the limited menu was varied enough to keep us interested for our five day stay. 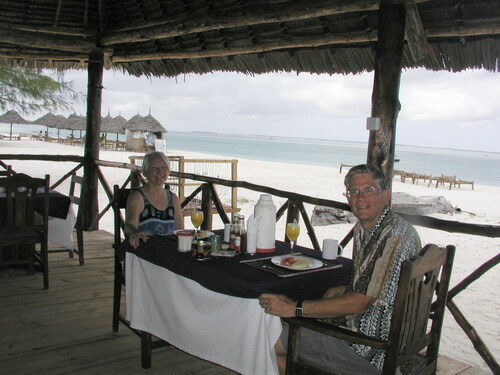 An evening entree was $10 to $14 (US), but the local currency was Tanzanian Shillings. 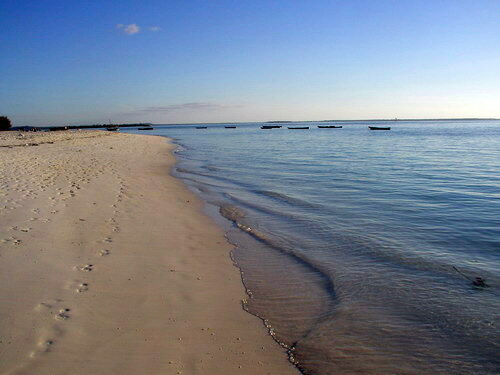 Zanzibar is famous for having some of the best sandy beaches in the world, and we certainly agree. 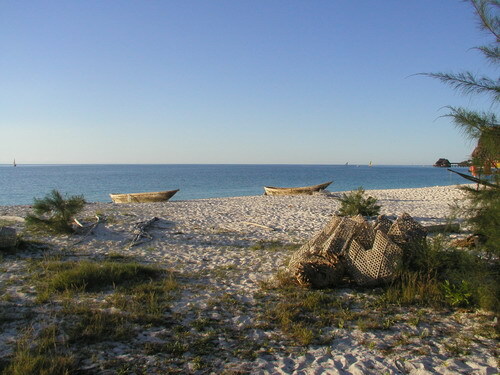 There are resorts here and there, but the area still retains its unspoiled, local charm, and the shallow waters are still active with village fishermen. We never got tired of walking the shore. 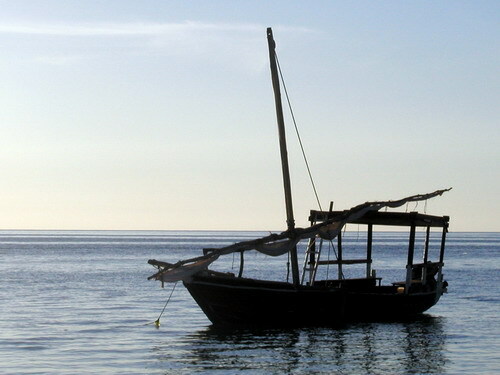 The dow is the local mode of water transportation. 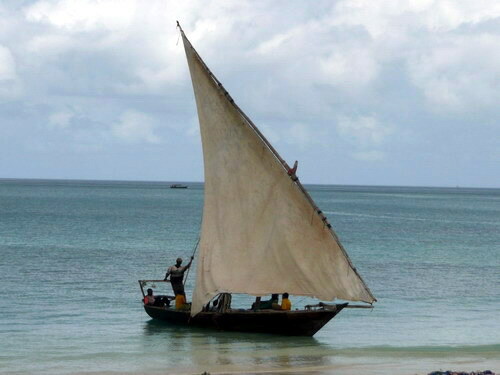 A traditional craft well suited to its task, they have remained unchanged for hundreds of years. 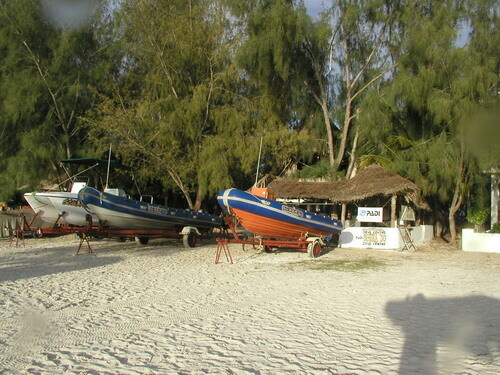 We dove with Scuba-Do Zanzabar, a modest little shop situated right on the beach, and just a five minute walk down the beach from our resort. They were a wonderful little operation and we highly recommend them! 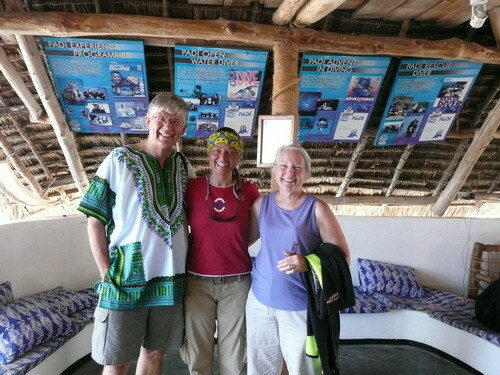 At the end of our stay, we wanted a pic of Christian and Tammy, the owners of the dive shop. They were great in every respect, and we particularly enjoyed the dynamic and energetic spirit that Tammy showed us on each of the dives she led. Her pre-dive briefings were the best we've ever heard! And how's this for service... months later, I emailed Tammy this web page and asked her to help ID a few of the fish. 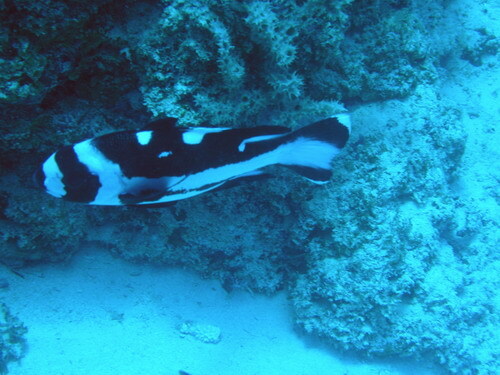 She responded by providing the common name and latin name of every fish, coral and invertebrate in every picture here!! Wow, that just blew me away. Way to go, Tammy! The text in brackets and italics on the pictures following is Tammy's. So let's go diving! 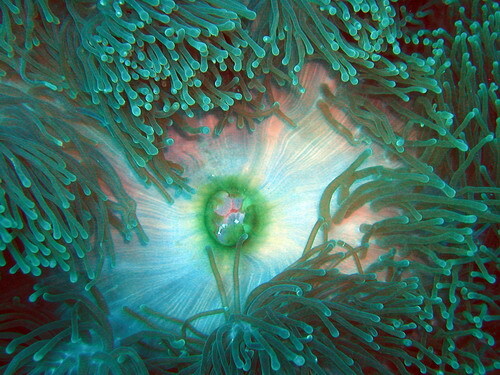 I was delighted to find lots and lots of anenome fish, hanging out, in the anenomes. 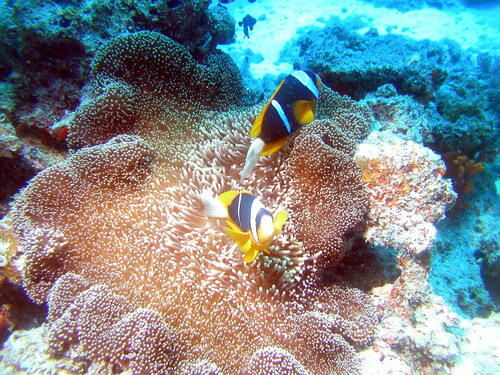 :-) But we never found a clownfish, the king of anenome fish. I guess they don't swim as far as the Indian Ocean. 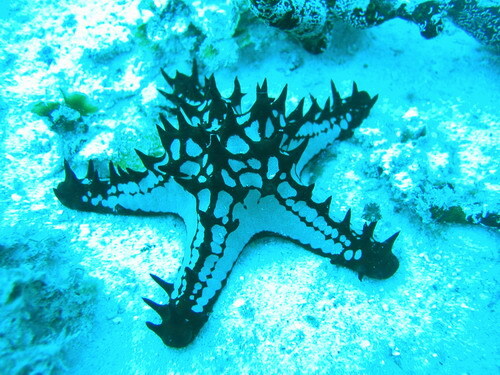 The underwater life was abundant and vibrant. 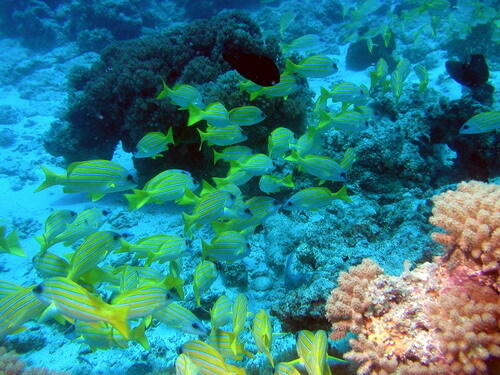 Fish everywhere and huge banks of colorful coral met our eyes. 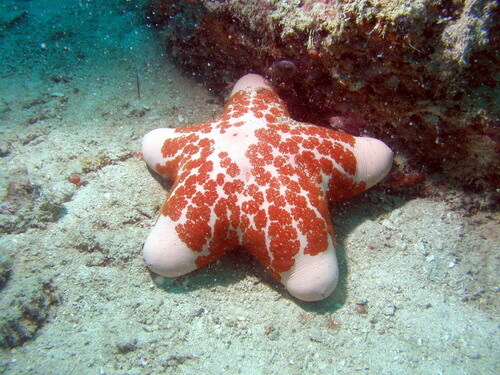 Here is a wonderful puffy starfish that was fairly common. It looks like an overstuffed chair cushion! 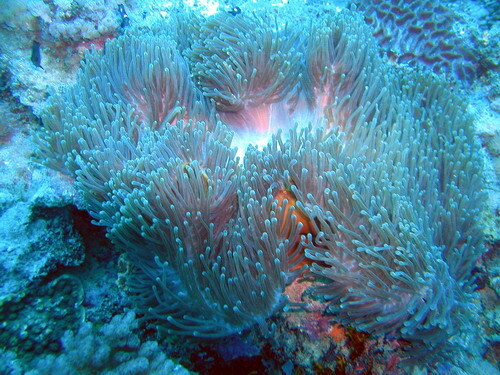 Here is a school of juvenille anenome fish. 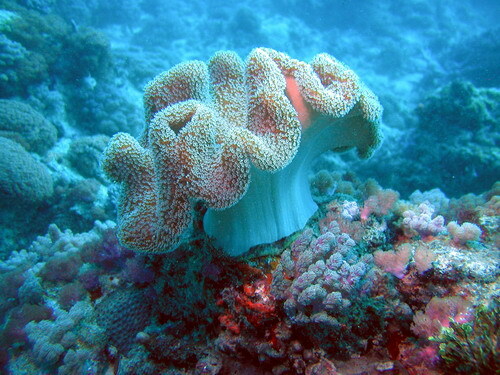 When we got close, they all dashed into the crevices of this hard coral and literally dissapeared in an instant before our eyes. Our first ever sighting! 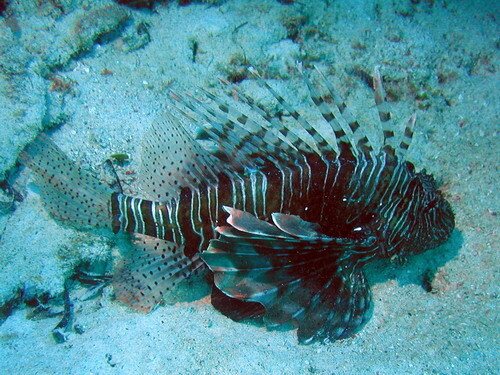 A Lionfish! 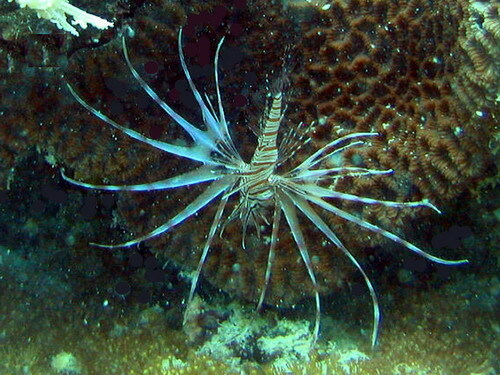 Another lionfish. 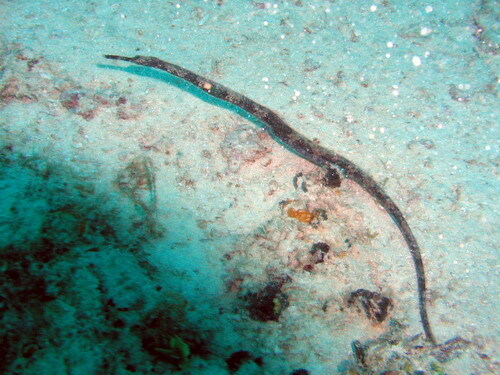 We saw lots of them! 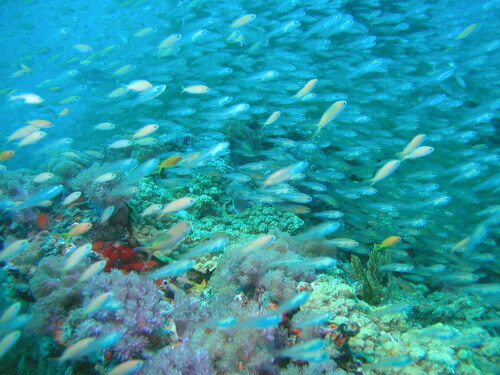 Here is another school of juvenille fish. 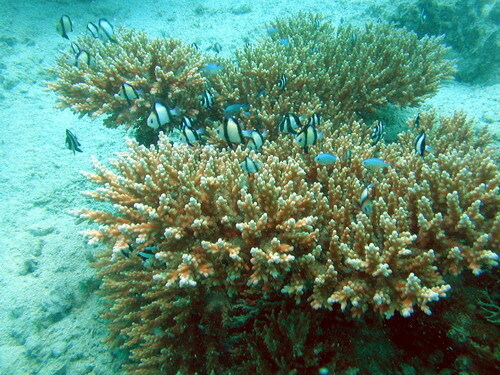 We loved how they all dashed into the coral for protection, and simply vanished when we got close. 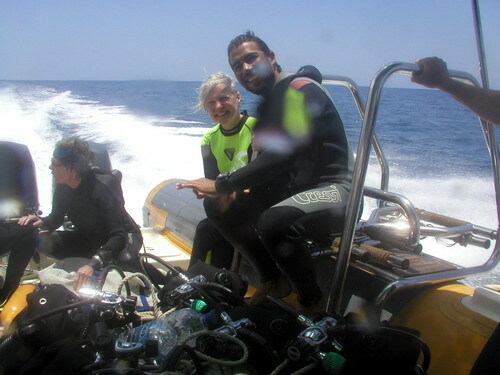 Joan reviews the last dive with divemaster Juan, discussing the fish life, while we zoom to the next dive site. 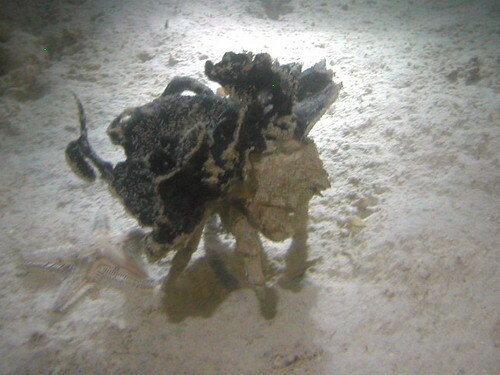 We did a great night dive, and here found a decorator crab taking a walk across the sandy bottom. 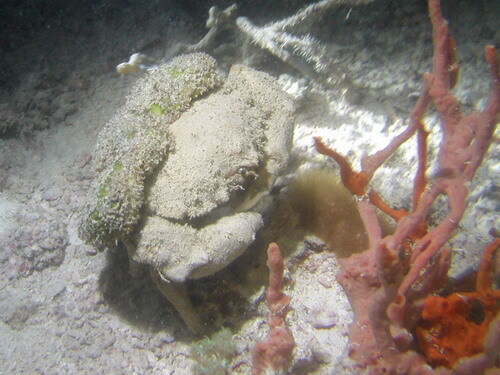 This particular type of crab accumulates algae and debris on it's shell for cameflage. This guy went all out, getting the cameflage on his back! 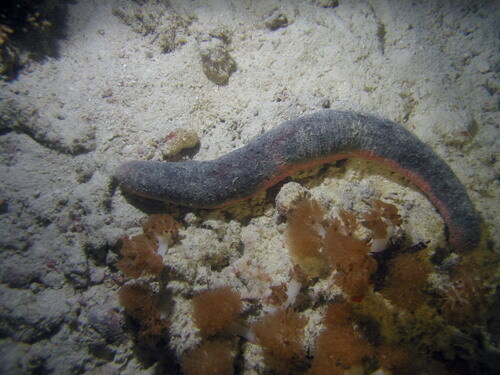 He looked more like a junk pile walking across the ocean floor. 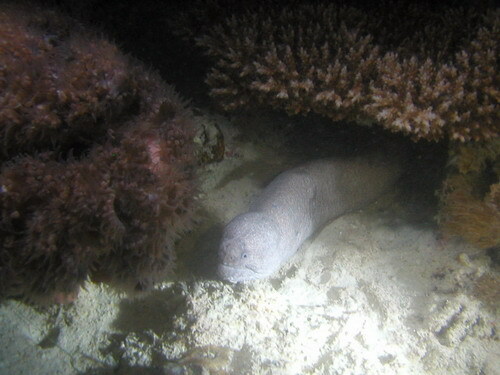 A moray gets ready to go out for an evening meal. Note: Tammy checked these references. 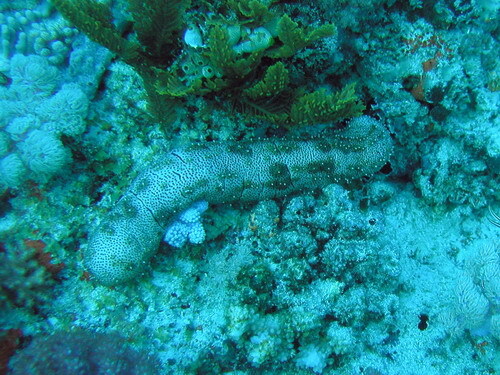 A fish you won't find in the Caribbean! Here is some interesting stuff. 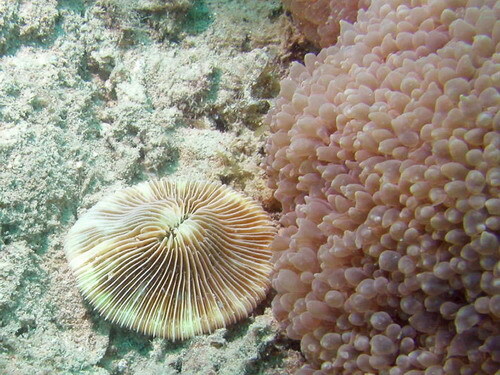 I had no idea what these where, but thanks to Tammy I now know that they are a mushroom coral and bubble coral! 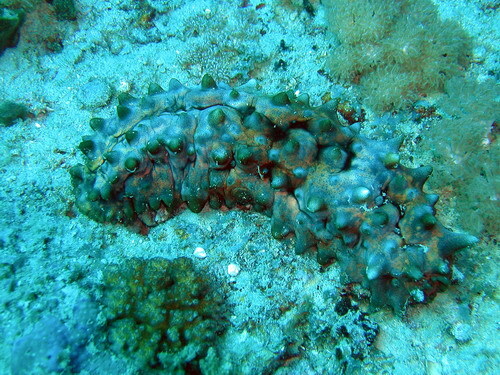 Another type of sea cucumber. 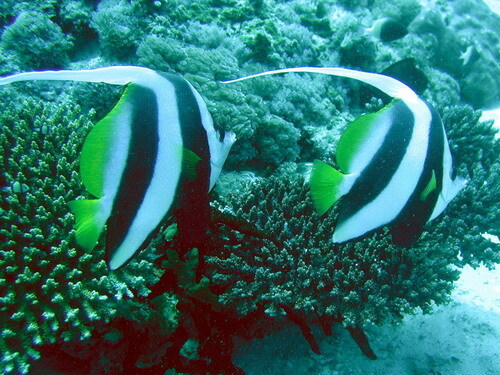 A gorgeous pair of fish, always cruising in two's. 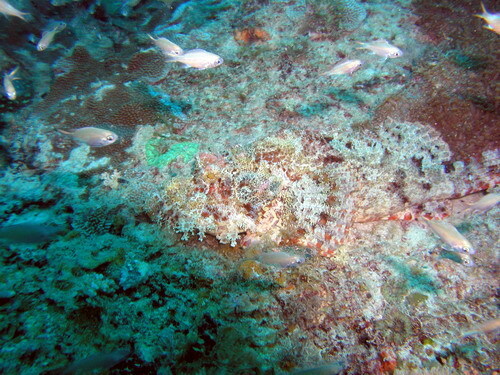 Can you find the scorpionfish? This one is easier to find! 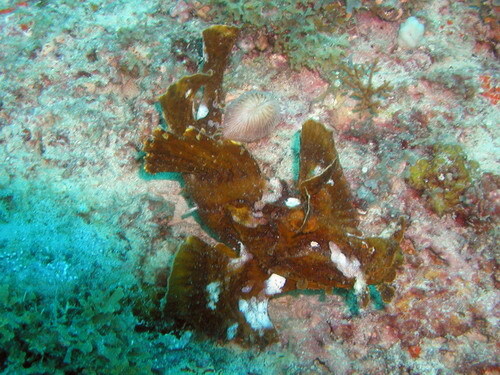 On this dive Tammy told us we'd see three different kind of scorpionfish, and indeed we did! 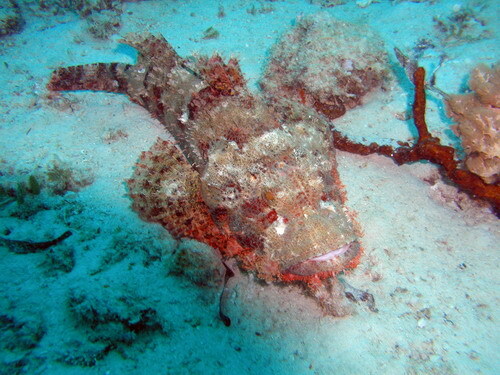 Here is the bearded scorpionfish. 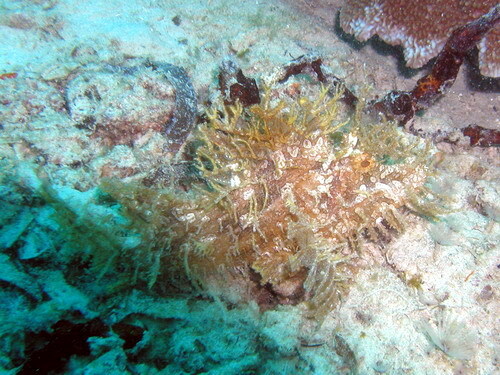 Here is the weedy scorpionfish. 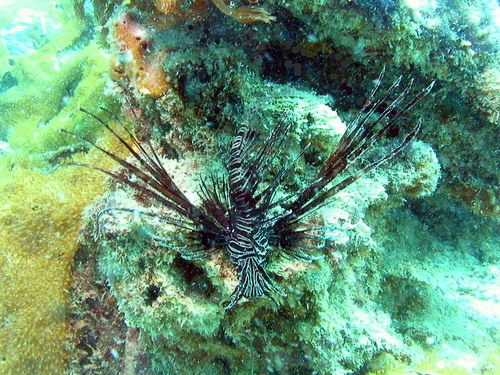 Another lionfish. 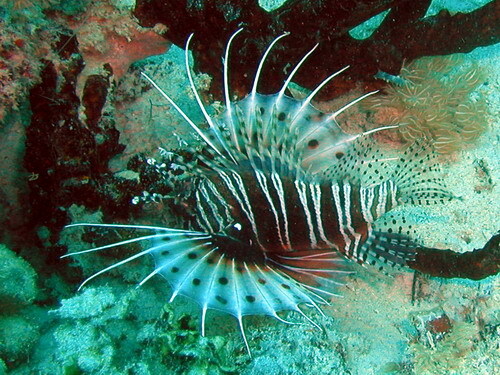 This one is a spotfin lionfish. 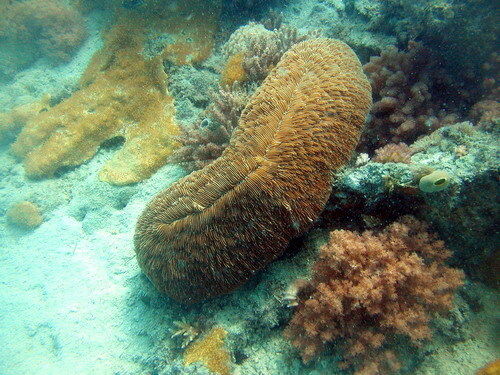 (Sarcophyton glaucum) - a type of soft coral, but no common name that I am aware of. 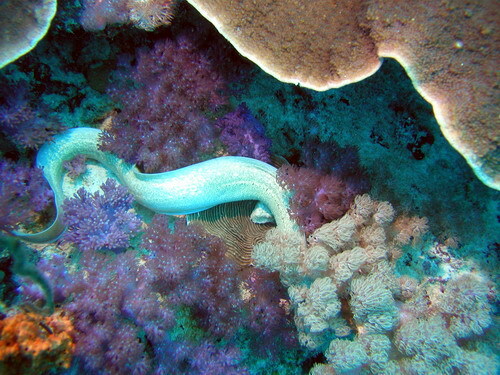 A moray forages during the day. 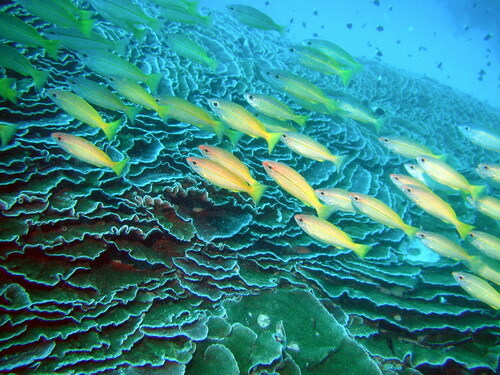 A small school of snappers cruising over one of the big coral heads. 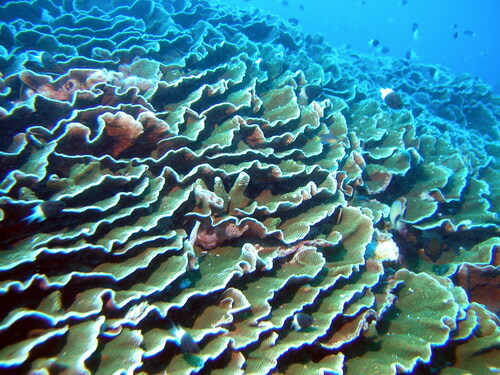 The coral at this divesite where really big and beautiful. 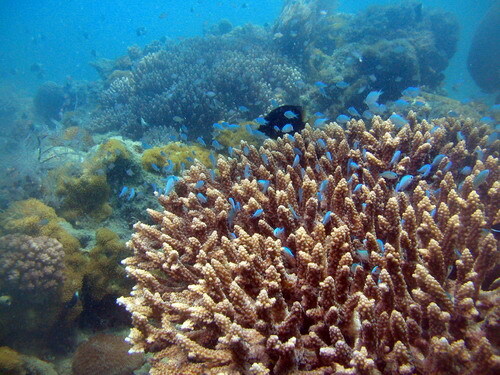 The size of the coral banks, the multitude of fish and the beautiful colors were just awesome. What a great dive. Inside the dive shop with Tammy. 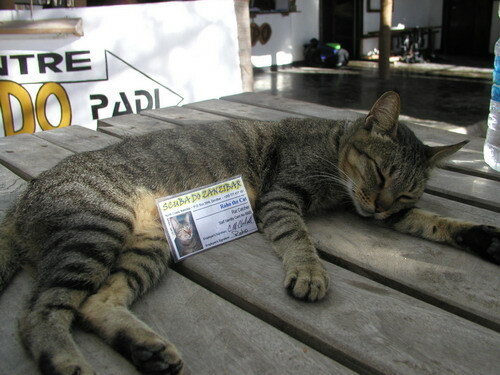 "Roho" was an official member of the dive shop staff, complete with ID card. 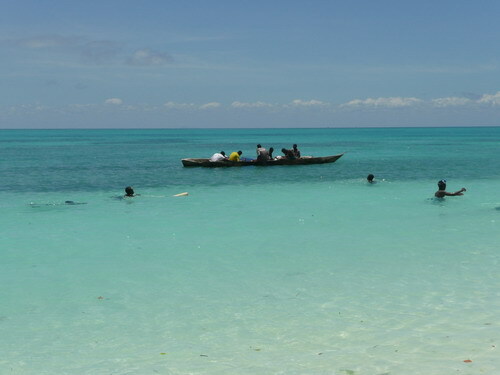 Local fishermen string out out a little net in the shallow water. 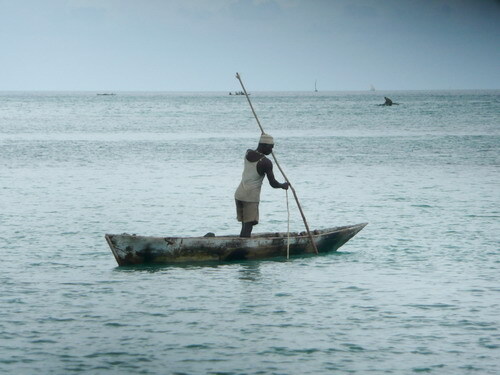 Another local fisherman working from his boat. There were constant reminders that we were definitely in the third world. We loved seeing these dows gliding up and down the coast. 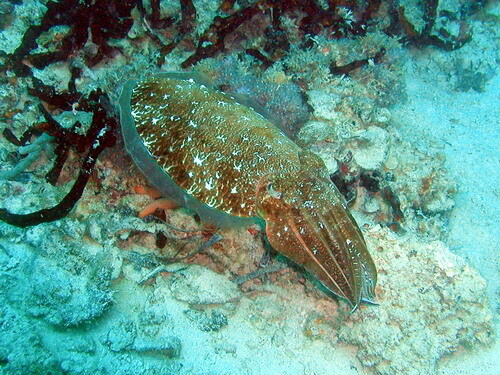 The local fishermen have a slightly different view of the marine life. 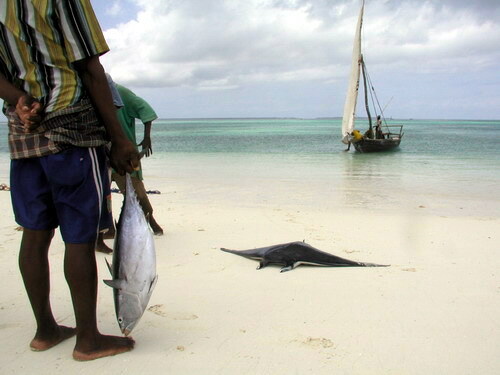 The caught a small manta ray and had it on the beach. This is the first one I'd ever seen! Maybe someday I'll see a big 10 footer swimming. 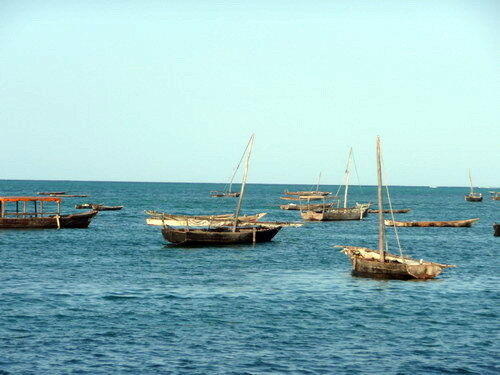 Another scene of the local fishermen's boats, back from a day's work. 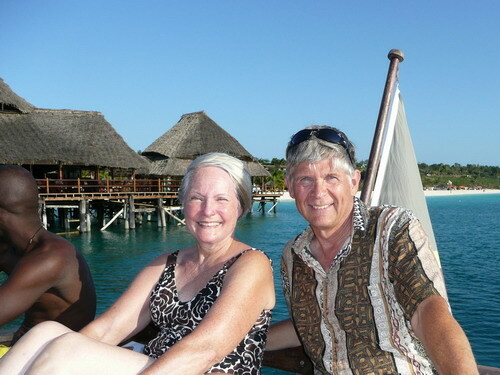 On our last day, we took the "sunset cruise" on a big dow, and sailed up the coast. The views were great and it was fun to just sit back and chill out. 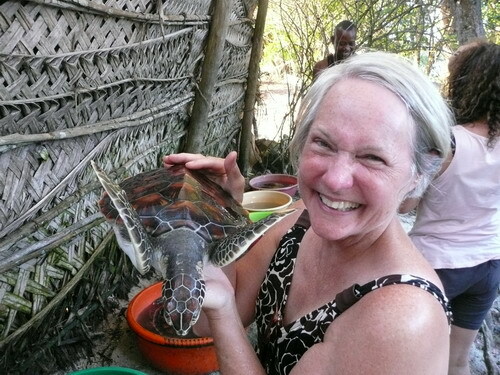 We made a stop at a small turtle sanctuary, where an inland lagoon served as a "safe haven" for about 30 big turtles. Whenever possible, turtle egg nests were rescued and the hatchlings where raised to adulthood and then released. 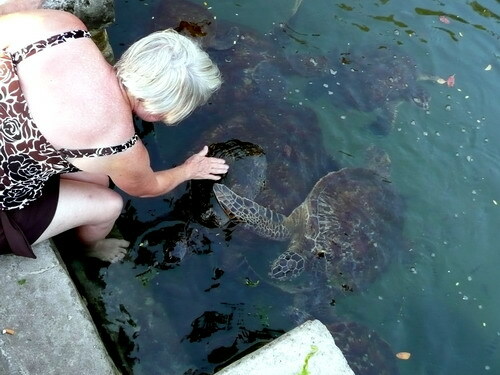 Here we see them seperated into little tubs for feeding, so they could be sure each turtle got the right amount of food. 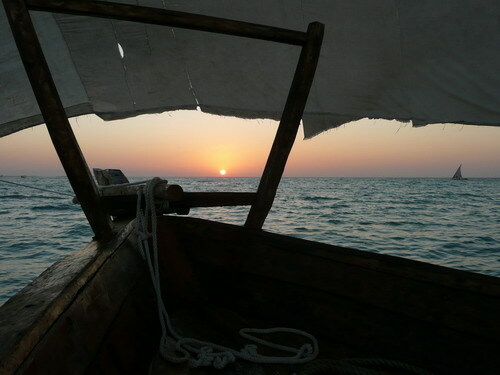 The sunset cruise was simple and relaxing, and we recommend it! 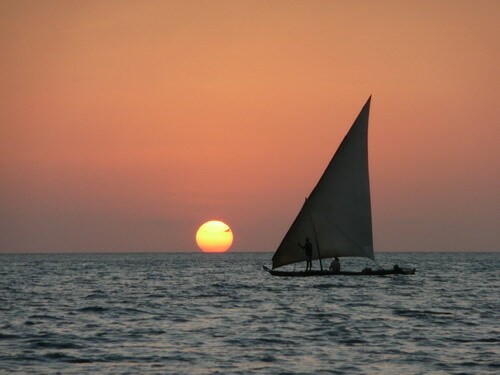 The old boat was simple and unique, and the sails worked fine. 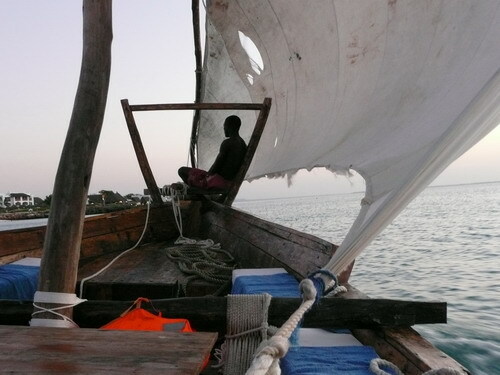 If you ever find yourself on the east coast of Tanzania, you can take a boat over to Stonetown, on Zanzibar, and catch a shared minibus to the north end of the island. 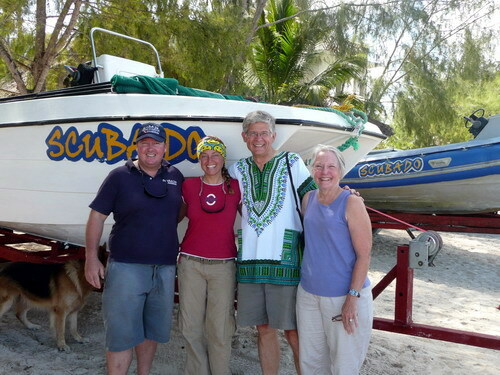 When you get to Scuba Do, tell Christian and Tammy that John and Joan sent you!